How safe is mineral water or bottled water ? 3. How does water become spiritually purer ? On the road and thirsty? Not a problem. Nowadays there is a wide variety of bottled water or mineral water to choose from, with all of them claiming to have a high degree of purity. As we break open the seal and quench our thirst, we feel safe in the promise of purity. But, does a ‘pure mineral water’ label mean that it is really pure and good for us and our families ? Spiritual research has shown that when assessing any aspect of life, one needs to understand it from a spiritual perspective too, or else we are missing a large proportion of the complete view. When we include the spiritual dimension in assessing the purity of water, not everything is what it claims or seems to be. 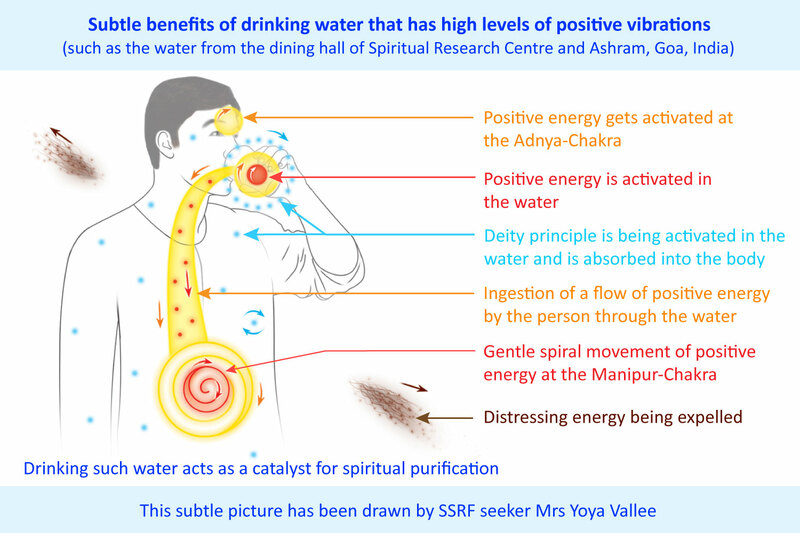 The Maharshi Adhyatma Vishwavidyalay (MAV, also known as the Maharshi University of Spirituality) and the Spiritual Science Research Foundation have undertaken a study of the subtle properties of water. The details of the methodology used is provided in the article – A study and analysis of water and its subtle properties. As of 20 March 2019, 261 water samples from various types of waterbodies have been analysed and studied so far. Yet, it was only recently in Feb 2019 that 3 mineral water samples were collected from different cities (Paris, Athens and Katowice) and their readings piqued our interest. To our amazement, when we measured these 3 samples using the Universal Thermo Scanner, they were found to have the most negative vibrations of all the samples we had collected so far. The UTS instrument invented by Dr Mannem Murthy is able to pick up subtle distressing vibrations (associated with the objects being analysed) in the electromagnetic spectrum related to Infrared (IR) and Ultraviolet (UV). The instrument has patented technology that is able to pick up distressing vibrations in the IR and UV spectrums, which the inventor has labelled as negative IR and negative UV. Over a 5-year period, the spiritual research team has used this instrument extensively, conducting approximately 10,000 subtle energy and aura readings of various objects (living and non-living). It has been the team’s experience that the UTS is quite accurate in determining positive and negative subtle vibrations and the intensity of them. 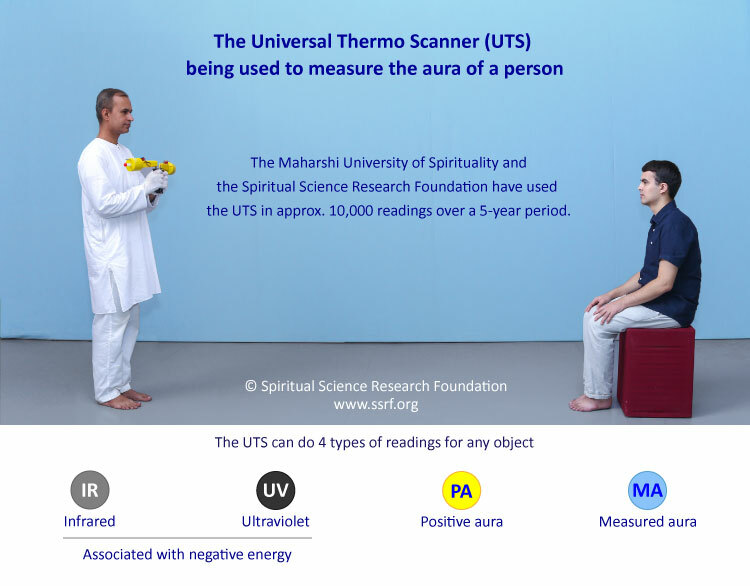 The UTS readings taken by the research team have corroborated the team’s readings obtained through sixth sense. These 3 bottles were local mineral/bottled water brands from that country and all of them claimed to have high levels of purity. And yet when tested for spiritual purity, they were found to be quite spiritually impure. The following were the readings from the 3 bottles using the UTS. Do note that IR (Infrared) and UV (Ultraviolet) are readings that are recorded when the UTS picks up negative vibrations. The UV reading denotes a more intense form of negative vibrations and is generally associated with the activity of negative energies. All figures of auras of the samples are in metres. As you will observe from the table, all three bottles had both IR and UV negative auras. To put things in perspective, only 26 per cent of the samples collected from 26 countries worldwide had the UV component (in addition to the IR component) when measuring them with the UTS. Later, on 17 Mar 2019, the research team purchased 6 mineral water bottles / packaged bottled water from 3 shops in a town in Goa. This was to investigate whether the above negative readings were obtained by chance or whether they were a reflection of a widespread issue with such bottled water. In the sample of six that was tested, four well-known (national and international) brands and two local brands were chosen. The following were the readings obtained via the UTS on 17 Mar 2019. As you will observe from the above table, all the readings of the bottles (taken with the UTS) were negative and had both the IR and UV components indicating higher levels of negativity. When ranked for negativity with the rest of the 261 samples worldwide, four mineral water samples ranked in the top ten as the most negative samples, i.e. positions 3rd, 4th 8th and 9th. Assuming that mineral water and bottled water companies do their best to provide society with physically pure water, they have little to no oversight of the spiritual properties of water. None of their processes involve the spiritual purification of water. So also no care in this regard is taken while transporting and storing bottled water. Bottled water and mineral water is usually sourced from springs, lake water, tap water and borewells; however, the study indicates that the source itself is more often than not may be tainted with negative vibrations. So when looking at the results, while it is concerning, it is merely a reflection of the current spiritual state of waterbodies worldwide. 86% of the samples tested from outside of India showed negative vibrations. Overall, close to 60% of the water samples in the study showed negative vibrations. From the samples that had been collected, a few lake and spring water samples were present, and their readings (taken with the UTS) have been provided below. Note1: In order to measure a negative aura, the UTS arms need to open to 180 degrees. However, this sample had an IR degree of 140° and having some angle is indicative of negativity. From the above samples, only one was neutral, i.e. the Powai Lake in Mumbai. Apart from that, the samples from the other lakes were found to have negative vibrations. From the above samples, only one was found to be positive which is the healing water from the Leechwell in Totnes in Devon, UK. The rest of the samples all emitted negative vibrations. So as you can see such water sources are more likely to have negative vibrations than positive vibrations. The subtle vibrations of water can be affected by various elements, one of which is the people residing in the area of the waterbody. The aura, the thoughts and attitude of people in that region will have an impact on the spiritual purity or impurity of the region. During the course of the study, it has been found that the water in flats (apartments) in the same multi-storey building will have different levels of positivity and negativity even though they are being served by the same main water pipe. One of the determining factors for this difference is the spiritual practice of the people residing in the flats. Note 1 : House 1 and House 2 showed signs of positivity but did not actually have a positive aura. Note 2 : The bathroom water sample is the only sample that did not come from the municipal water supply. Its source is from a borewell. What is interesting about the chart is that though all the water samples (with the exception of the bathroom water) come from the same Goa municipal water supply, yet they show a wide variety of readings. 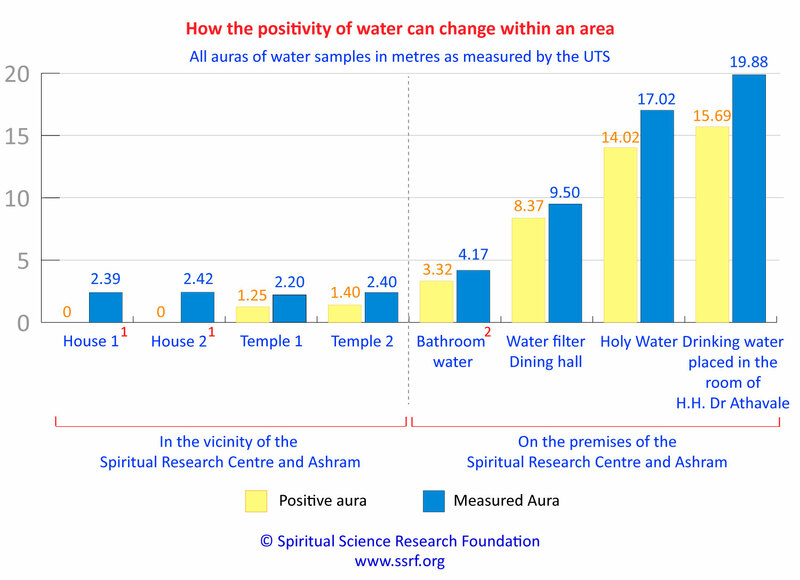 Even within the Ashram in the rooms where the positivity is more like the room of His Holiness Dr Athavale and the temple room, the readings of the water samples are much higher. The entire local area has many temples and can be considered a rural area. Therefore a key take away point is that when there is the presence of Saints and when people are practising Spirituality with dedication, it has a positive effect on the environment (soil, water, flora and fauna included). On 24 February 2019, a UTS reading was taken of a drinking water sample from a person’s house in Düsseldorf, Germany. The sample showed higher levels of negativity. 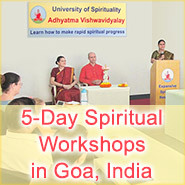 Thereafter, the sample remained in the Spiritual Research Centre and Ashram premises. 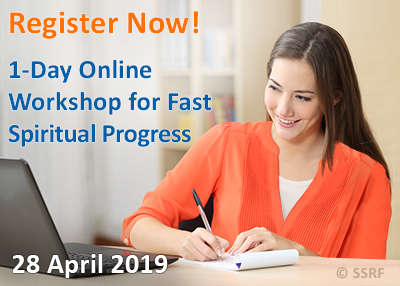 On 17 March 2019, another UTS reading was taken of the same sample and it showed that there was a substantial change in the readings. From the above table of UTS readings, you can observe a notable difference in the water sample over a span of 21 days. The sample now had a positive aura of 1 metre. These results are encouraging as it shows that the subtle properties of water can be changed as the environment changes for the better. Water is affected by the subtle vibrations in the environment. For those of us who fly a lot, these samples may be of interest to you. Out of the 261 samples, we carved out just the airport water samples taken from drinking water fountains and bathrooms on their premises. As you can see, all the airport water samples emitted negative vibrations. In fact, Manchester Airport Bathroom water (collected in March 2019) to date has become the new world number one negative sample of our water study. Changi Airport Singapore and London Heathrow as of 2018 are listed amongst the top 10 airports worldwide (as nominated by airport customers from across the world during the 2017-2018 World Airport Survey). However, when looking at the airports from a spiritual perspective, you will notice that the view is quite different. Water samples from both airports showed a high level of distressing energy (IR and UV components) which could be a reflection of the adverse subtle environments at these airports. The spiritual research team conducted an experiment to understand the subtle effect of drinking a very popular brand of bottled mineral water on two seekers. One seeker suffered from negative energy distress while the other did not. For the seeker with spiritual distress, his IR component increased by 38% after drinking the water. His IR aura reading was initially 1.08 metres and it increased to 1.73 after drinking the water. 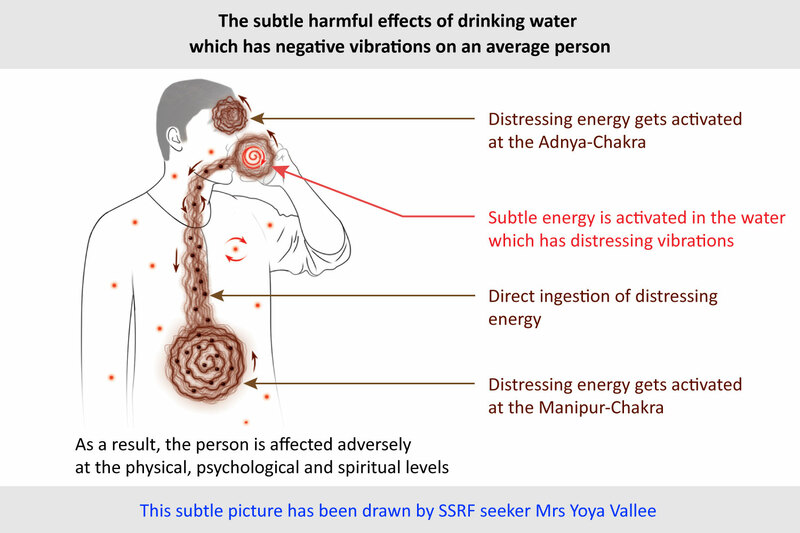 For the seeker who did not have spiritual distress is positive aura reduced by 60% after drinking the water. His positive aura reading was initially 2.25 metres and it reduced to 1.41 after drinking the water. Sometimes we may be complacent in heeding advice about what is detrimental for us as we are not able to perceive the actual detrimental effect of such stimuli in the subtle. However nowadays with the advancements in aura and subtle energy scanners, we are able to objectively see the effect of such stimuli. A person has to work hard at spiritual practice to gain a positive aura and then in one fell swoop he can nullify all the good work just by drinking water that is tainted with negative vibrations. A person who has spiritual distress (like a majority of people worldwide) will only increase the negativity around him thus making it easier for negative energies to continue to affect him or in some cases possess him. In the picture below a subtle artist provides us with a spiritual X-ray of what happens in the subtle to an average person when he drinks a glass of water that has both the IR and UV components as measured by the UTS. In contrast, this is a subtle picture of an average person drinking water that has a high level of positivity such as from the Spiritual Research Centre and Ashram. Such water enhances one spiritually and in fact expels distressing vibrations. The positive effect of the water is enhanced when one drinks it with spiritual emotion understanding its importance. It is easy to get lulled into a feeling of safety when one is assured of the physical purity of the water one is drinking. However, our research has shown time and again that physical purity does not equate to spiritual purity. In fact, what this study shows is that the water one drinks is quite likely to have distressing vibrations. 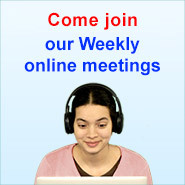 The impact of drinking spiritually impure water may not be immediately understandable to the person drinking. This is because negative energy can act in insidious ways affecting a person at various levels. Needless to say, a person will be adversely impacted when he or she ingests water that has distressing vibrations. Spiritual practices such as chanting the Name of God attract positive energy, which protects the person and minimises the effect of negative energies. Spiritual practice enhances the positivity at home, which can have a positive effect on the environment. A positively charged environment also has a positive effect on the soil and water. Regular spiritual practice along with spiritual healing remedies such as the ‘Saltwater spiritual remedy’ are the only sustainable way to protect oneself from the harmful effects of the spiritual dimension. What Name of God should I chant ?